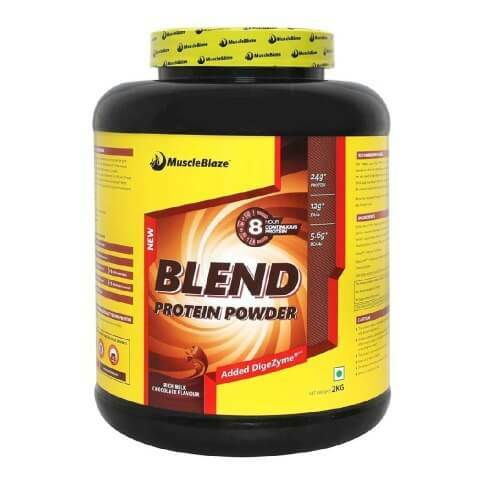 The Protein powder has added digestive enzymes to help the customer with easier digestion of protein. It comes in 2 flavours of Chocolate and Vanilla. The Protein powder has added digestive enzymes to help the customer with easier digestion of protein. It comes in 2 flavours of chocolate and vanilla. It comes with 24g protein, 5.6g BCAA's and 12g EAA's leading to muscle gain, muscle synthesis and muscle retention. consumers should mix 1 scoop (40g) of product in 180 ml of cold water and use between major meals and exercise for great results. To Recieve updates and possible rewards for MuscleBlaze Blend Protein please sign in. To Recieve updates and possible rewards for Diet Supplement please sign in.